The Malta Communications Authority (MCA), which falls under the Parliamentary Secretariat for Financial Services, Digital Economy and Innovation within the Office of the Prime Minister, and is responsible for overseeing the eCommerce sector in Malta and for the Malta Cloud Forum, had the pleasure of collaborating with EC English to develop this Trust in Cloud story. The interview was carried out by Joseph Seychell, Manager IT and Technologies at the MCA, and Simon Jones, Head of IT at EC English Language Centres. Jones describes EC as a ‘globally recognized and trusted brand’, with more than 20 schools across 5 different countries. Thus, technology - more specifically Cloud technology - is an indispensable, invaluable tool for companies such as EC, whose aim is to succeed as a global community. In fact, Jones noted that EC moved onto the Cloud in its relatively early days back in 2009, setting up a private hybrid Cloud in a UK data centre. This not only owes to the company’s reliance on the Cloud for efficient and effective communication and collaboration with third parties and staff members themselves, but also due to the fact that EC operates across different continents with different time-zones. Hence, Infrastructure as a Service is entailed in order for the day-to-day operations to carry on incessantly in the absence of human resource. Moreover, Jones emphasised that in order for a company to be competitive in an industry that is ever-changing, offering superior services while managing the internal operations in the smoothest manner is imperative; and the Cloud is the key enabler. When asked how best to achieve trust in Cloud, Jones highlighted that the company follows a due diligence process according to the use of the service, ensuring that industry security and best practice are adhered to. With regard to Shadow IT, Jones stressed that despite the fact that it is unavoidable, EC’s IT team ensures that it can draw on a wide portfolio of sanctioned services to help meet the employees’ needs. Moreover, in order to verify that a potential Cloud service is high quality prior to putting it to use, Jones stressed that EC conducts extensive research with particular emphasis on case studies, and everything is tried and tested for further evaluation and in-depth analysis. Given the importance of the Cloud within the company, Jones stressed that ensuring that staff members are well-equipped to operate on the Cloud is fundamental. However, Jones claimed that this has never proven to be a challenge for EC as all IT-related procurement is presented as a Business Case to the ‘C Level’ Executive Group before being approved. When asked whether Cloud certifications are given extra credit, Jones claimed that whilst this is not required when employing new IT staff, he admittedly stated that added weight is given to individuals with a solid background in Cloud Computing. Jones concluded that the Cloud, specifically Software as a Service, also proved to be a priceless device to help the company comply with GDPR, allowing it to govern, protect and monitor data effectively. 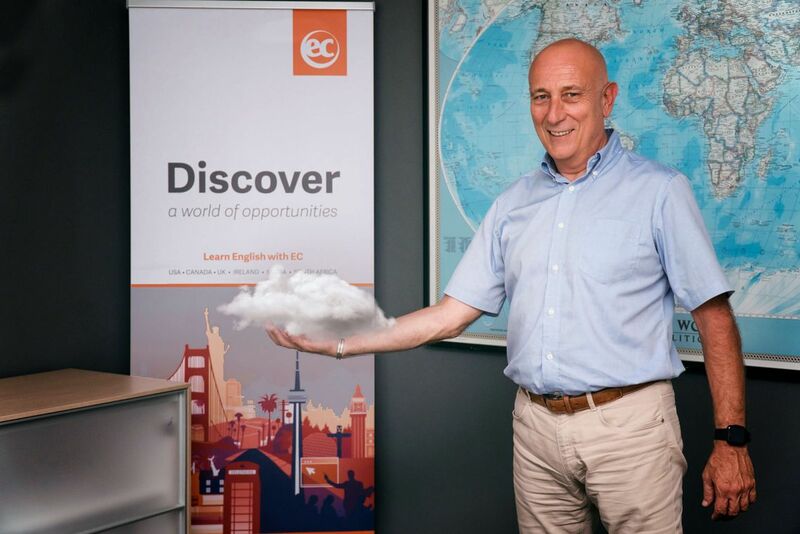 The MCA thanks EC English for their collaboration in this Trust in Cloud story, and is proud to present the company’s interesting journey onto the Cloud along with Mr Simon Jones’ role as the lead of EC’s Global IT Infrastructure & Services Teams to Eurocloud.